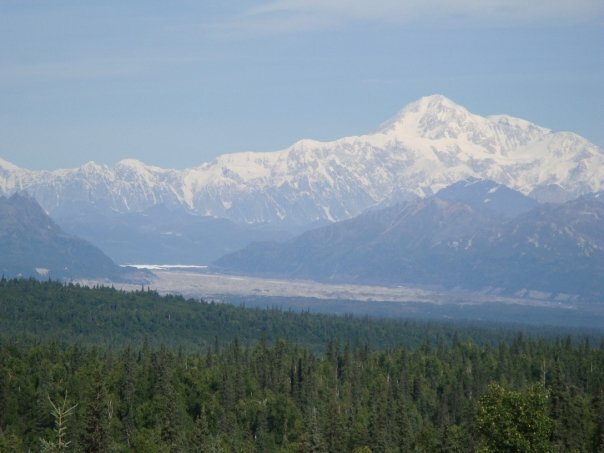 I took this picture July 2009 of Denali Mountain (to those outside Alaska, it is casually known as Mount McKinley). It was one of the most breathtaking moments of my life! There was but one cloudy and rainy day and we were able to see the mountain every day except the last day as we were leaving. It was a blessing that this was the case when we were there and the people said living there, it is a rare occasion to see the mountain. I spent a good amount of time staring at it, contemplating. Like I said previously, it was a blessing indeed and if I could have stayed and watch it forever, I would have. To be in God’s wonder and awe was absolutely beautiful. I was led into this prayer I was not even fully aware of existing in me! This is what I want with my life, to live life in such grander and have such amazement filling me. As well, to know that God sees that same beauty in me that I see in that mountain. I see the following quote to relate to this experience. Who are we not to be great? No, not in the egotistical way that many people may be drawn to see this as. We are children of God born so that we may show God’s glory to everyone. This is not just in some of us, but in all of us. God believes in us otherwise He would have not put us in the world with such responsibility. I found this quote, author unknown: “Just because you don’t believe in God doesn’t mean that God doesn’t believe in you!” This is something that we can really think about with our lives. By taking the strength found in God, in Christ, we can let our light shine out for others to see. When we let our light shine, we allow others to do the same thing. It is truly amazing how this is, when one person’s happiness can feed another person’s happiness. When I talk to people about wanting to enter religious life with the Salesians, to God-willing become a Daughter of Mary Help of Christians, FMA; there is something special that happens. My excitement and smiles shine from me like more than ever, and it bounces off those I talk to and back to me, re-energizing me and reminding me of what makes me happy. While, as I have mentioned before, I have yet to finish and turn it the application, knowing that there is hardly a thing standing in my way at this point makes things so much better. When I finally get all the paperwork in and hear back, I can only imagine the feeling that will fill me. It is like that of staring into the wilderness at Denali. The awe-struck wonder that almost took my breath away in such beauty that I wish I could live with always may be found in this place, this life, that I am pursuing. Isn’t it glorious? Who am I not to take this step forward and follow the path it seems God has given me? Who am I not to try and find where God’s light will shine the best in me? Who am I not to follow Christ and be His disciple? I am a child of God and I am going to live as so!